Just an all-around excellent experience from sales to installation to financing. We were looking to replace all windows for a rental property so we weren't looking for top-of-the-line. We had a couple of companies come out and Brandon from WoW was the only one to tailor the sales to our needs. Others just ignored what we wanted and barreled ahead with their practiced sales routine. For example, Anderson came in hot and heavy (demanded that both my wife and I be present for the pitch) and offered up a quote for high-end windows that was three times what WoW was offering. Windows were delivered as promised. Installation was easy to schedule; they showed up on time, installed all windows without any issues, and kept the rental unit tidy. I am a very details-oriented person and understand construction--most home projects I do myself since I can't find anyone who will perform to my satisfaction. Consequently, I had a lot of reservations about hiring a company to complete a job too big to take on myself--installing additional windows in my home. I and my wife interviewed many contractors before we found one that we felt was up to the task. It was still a leap of faith. Ultimately Windows on Washington vastly exceeded my expectations. They installed eight new windows in my home. I carefully inspected the work on each completed window. The windows were properly flashed and sealed to prevent water intrusion and air leakage, there was a beautiful, continuous solid bead of caulk at each seam and no damage was done to the surrounding siding. Inside our home, each window was level and square at every plane and dimension. Even the diagonal measurements across the trim were within an eighth of an inch in a span of over 50". Amazing craftsmanship! Mostly importantly, on a project of our scale and we wanted a dynamic company capable of dealing with unforeseeable issues. Eric was unflappable and stood by his work until we were satisfied with every detail. It's great to see a company take pride in their work. Windows on Washington earned every penny we paid them. I wanted to thank you for the awesome job you and your crew have done for our home. From the insulation to the windows and the garage doors, everything looks and feels great and went above our expectation. The quality of work done and material is exactly what we hoped for our home and we are truly happy with everything. I am so glad we trusted you and your company and you will definitely be our first choice for any future work at the house. Dyna will miss you.... she told me to tell you that you can come and visit her anytime! OUTSTANDING! From the initial contact through measurement and installation, I couldn't have expected better with a quality product and installation. Very professional with honest window information that other window contractors don't provide. There is a lot of misinformation being provided by other window vendors and most at outrageous prices. We found that spending more money and top dollars does not equate to a quality product or installation. More is mostly less. Windows on Washington contributes true information about windows on many online outlets. After much research and many window vendor visits, we made the right decision and chose Windows on Washington. We chose WoW for the technical competence and product knowledge demonstrated by the sales representative (Brandon Shonebarger)...Set customer expectations, provided periodic status updates and completed the project as advertised......Great pre-sales response and appointment setting, sales representative and fair pricing on our project. The salesperson was great; he helped us determine what we needed and didn't try to sell us things we didn't need. The installation crew did an excellent job. Start to finish, terrific experience. We have used other window companies with connections I have in real estate, but they did not compare. WoW provided clear communication, the items ordered were exactly what we wanted, and installation happened on time. Absolutely no complaints, we are very happy with the results and will be returning customers. I also am very confident in referring this company out to my clients as well. I'd add a big thank you to Brandon in sales and Julia and staff in the office. Crew that came for installation was exactly how we like to see it, they were super neat and easy to work with. Before I start, I need to say this is only the second one of these online reviews I've ever written. It's one of those things you always say you'll do about a company you like (or don't), but never get around to doing. In this case, I feel compelled to let people know my experience(s), especially since my bar is undoubtedly higher than it is for most people. In 2014, I decided to see about replacing the 30-year-old windows on my townhouse. I asked friends for recommendations, did research, and read blogs (I never read blogs...), and had some companies come out and talk to me and provide estimates. I soon became convinced this was like the used car industry (draw your own conclusions). I kept researching, and, one night, noticed a blog from a former installer/now contractor who was answering people seemingly very intelligently and knowledgeably across different blogs. He responded to one person in the DC region with, "You live in the DC area? You have to talk to Windows on Washington." That recommendation was enough to send me to WOW's website where they offered an objective guide to buying windows. What a concept! "Here's what you need to know even if you don't buy ours." Of course, I had to provide my email address, but I was so impressed I gladly gave it to them. After reading the brochure, I was actually anxiously awaiting a call from them. I didn't hear from them at 9:01:01 and was surprised! By 10:00, I still hadn't heard from them, so I called. They said, "We were going to get to you." I was so impressed that they weren't already at my doorstep! Zach came out and so impressed me with the depth of his knowledge, his attitude, willingness to work with me, and no-pressure tactics - not to mention price - that I was stunned. Also, I realized I had seen the owner (Eric) contribute in various help forums while on my blog travels. I also had them do a roof check-up last year. Zach came out and went up on the roof and showed me pictures of previous fixes that had been done (shoddily as it turns out). Then he showed me their work. Like day and night. A friend of mine also used them and felt the same way. And, I asked them to do a special job for me, outside their normal purview. They did it. I am so impressed and would highly recommend them to anyone and everyone. Great experience with Windows on Washington. The salesperson was great. He did not try to sell me a more expensive window that I didn't need and he did not try to keep bargaining over the price as some salespeople do. He was very straightforward. Price was reasonable. 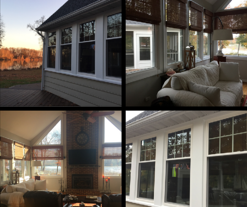 I had eight double hung windows installed. They did an excellent job. I also had my bay window capped, which also looks great. I didn't even know the wood on the bay windows could be capped to be maintenance free for pretty much forever, until the salesperson suggested it. Definitely worth the extra few hundred dollars. They also cleaned up everything. Other than the new windows, you can't even tell they were there! Will definitely recommend to anyone needing new windows or other projects done. The windows are well made and look great. The trim work was top quality. Very please with the detail workmanship" Very satisfied with WoW. Yong Kim does the best work. I trust his workmanship anytime! Price was competitive (not the cheapest) but service was great. No high pressure sales tactics. the installation team was top notch.....Joon and his installation team where awesome and overcame the miscommunication about wrapping window sills in a way that left me feeling that I absolutely made the right choice in picking WoW. Every employee I dealt with from the salesman to the office staff to the installation crew was courteous and professional. Communication was excellent throughout the process. My new windows are beautiful, and I'm looking forward to having them replace the others next year. I just wanted to say thank you from start to finish. Very impressed with everything! Crew today was great. I’ll leave a yelp review and will recommend your company. Thanks for checking in. It couldn't have gone better. Working with David has been awesome. He is knowledgeable, personable, an excellent communicator, and an all around valuable asset. Joon and the crew did a fantastic job. They were clean, fast, and paid attention to detail. I've worked with a lot of subcontractors in my side dealings in real estate and I can confidently say my experience with your company was one of the best for sure. I am very happy with the product, service, and glad I decided to go with you guys. I promised David I will leave a review on Yelp and I plan to do so in the coming days. In addition, let me know if you ever need a customer reference. I certainly don't mind getting a couple calls a month and will give an honest, glowing review. I appreciate everything you guys did. Take care. We have had the best possible experience with Windows on Washington. They replaced all of our windows and in a separate project installed a new front door, storm door and shutters. We have worked with Zach both times and he is amazing: friendly, professional, knowledgeable and NOT pushy! We told him upfront what our budget was and he worked with us to find the best window and door options for our needs. We really appreciate his honest and expert advice. We have been extremely impressed by the professionalism, communication, and high quality work of Zach, Julia in the main office, Young the installation leader (sorry if I'm spelling his name wrong!) and the entire WoW team. They clearly care about doing a great job and even take extra steps to make sure our home is left sparkling when the job is complete. I would definitely recommend Windows on Washington. It was easy to schedule a free estimate. Brandon came to our home and gave us about a 15 minute overview of their windows and the installation process, measured our windows, and answered all our questions. We never felt pressured and he was very professional. Once we decided to go with Windows on Washington for our replacement windows, ordering windows and scheduling the installation was smooth and easy. I had never heard of Windows on Washington before a few months ago. I was in the market for new replacement windows for my house and happened to be visiting with friends who were also in the process of researching vendors and options. My friends told me about Windows on Washington. I am so glad they did! I had previously had 6 replacement windows installed about 7 years ago by a different provider, and the windows have been great. However, given 7 years had elapsed I wanted to research current options. Windows on Washington has been excellent from start to finish. Their pricing is fair and the quality of the windows and the installation are top-notch! It took 6 weeks from the day I received my estimate and made my decision to the installation. Greg Schwartz (sales) was a pleasure to work with. He explained all the options very well and was super responsive to my questions during my decision making process. Communications from the office were clear and explanatory of the next steps in the process. Joon Kim, my installer certainly takes pride in his work! He came out a few days after I signed my paperwork to take final measurements. And then he came back for the actual installation. He and his crew did an excellent job and cleaned up from the work at the end of the day. Joon explained what I needed to know about the operation before he left. The windows look beautiful and my house feels like new. Thanks Windows on Washington. I hope you're doing well. 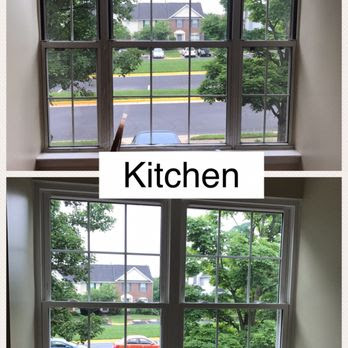 Joon and his team came out to install my new windows last Thursday and I wanted to share how happy I am with the work they did and the finished product. The windows look great. And in my view, Joon went above and beyond to ensure a quality and aesthetically pleasing installation inside and out. He also worked with me to make sure my existing window blinds would fit within the window frames after installation of the new windows. I look forward to working with WoW again for the last set of windows that need to get replaced in my house. We recently used Windows on Washington and it was the best experience we've ever had with a contractor. Windows on Washington installed 13 new windows in our home and did a fantastic job at every point from the initial sales call, scheduling, and installation. Their installers (Young and Joon) know what they're doing, which is evident when you see the finished product. In addition, we worked extensively with the owners, Eric Novotny and John Baker, who went above and beyond to help us with our leaking front door. Windows on Washington was one of 6 companies we consulted to find a solution for our leaking 6 year old ProVia front door, and they were the only ones who tried to help us without selling us a new door. John and Eric figured out the issue and were able to get us in contact with ProVia who covered an entire new door under warranty, installed by Windows on Washington. Both owners came the day of the door install and Eric actually re-engineered areas that could potentially let water in so we don't have any problems in the future. If you're in the market for windows or doors, we HIGHLY recommend Windows on Washington!